Amphibious assault ship USS Kearsarge (LHD 3) rendered a seven-gun salute with U.S. Army Garrison Fort Hamilton, with Fort Hamilton providing a 15-gun salute in return. "New York has always had a close relationship with the military," said Anthony Giovinco, U.S. Navy Vietnam veteran and chief of staff and secretary of the United Military Veterans of Kings County Memorial Day Parade. "The Sailors, Marines and Coast Guardsmen are treated very well here. This is a tradition that is important to me. It brings back fond memories of the years I spent in the military." In addition to Kearsarge, USCGC Hamilton (WMSL 753), Kingston-class coastal defence vessel HMCS Glace Bay (MM 701), Arleigh Burke-class guided missile destroyer USS Lassen (DDG 82), Ticonderoga-class cruisers USS Monterey (CG 61) and USS San Jacinto (CG 56), Oceanographic research ship RV Neil Armstrong (AGOR 27), Cyclone-class patrol coastal ship USS Zephyr (PC 8), Spearhead-class expeditionary fast transport USNS Yuma (EPF 8) and U.S. Naval Academy yard patrol boats participated in the Parade of Ships. FWNY offers Sailors, Marines and Coast Guardsmen an official opportunity to participate in community relations projects, parades, re-enlistments and school outreach. It also exposes the general public to various military careers, ships and the services they represent. Students from the area will have the chance to learn about military aircraft, military careers, and interact with Sailors and Marines throughout the week. During FWNY, general ship tours will be conducted in Manhattan, Brooklyn and Staten Island. Visitors will learn about the latest capabilities and technologies of today's maritime sea services, such as job specialties, firefighting techniques, environmental safety, energy awareness and damage control aboard ships. There will also be the opportunity to see and interact with aviation static displays. 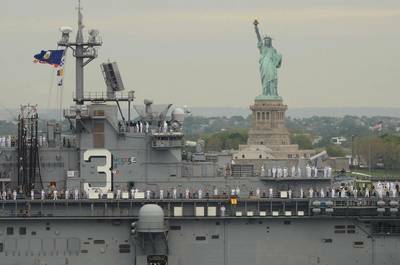 "Fleet Week New York is a way for the general public to view and experience the maritime sea services while allowing us to show our appreciation for our Sailors, Marines and Coast Guardsmen," said U.S. Army Spc. Tanner Butler, currently assigned to U.S. Army Garrison Fort Hamilton. "I feel, that since 9/11, it is really important for the people of New York to experience these things and to remember that our fellow Sailors, Marines and Coast Guardsmen are there for us."